As the official news source of the Assemblies of God, AG News provides news for, about, and from the Assemblies of God. 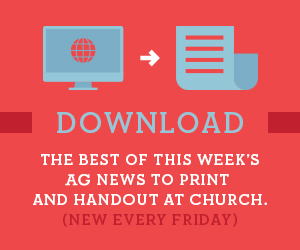 With news and inspirational stories posted online daily and an e-newsletter and downloadable pamphlet with a collection of the week’s top stories, AG News is your source to learn how God is moving in and through the Assemblies of God. Follow Us on Facebook, Twitter, RSS, the App, or e-newsletter.